on the hillside in the village of El Agua de Enmedio. Although we are part of the Church of England Diocese in Europe, all Christian denominations are welcome to join with us in worship. Refreshments are usually available after the service. Why not have a coffee and a chat in the sunshine. 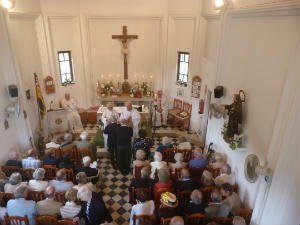 Our church is on the coast road travelling south from Mojácar towards Carboneras. After leaving the built-up area, travel on for about 4 kms. 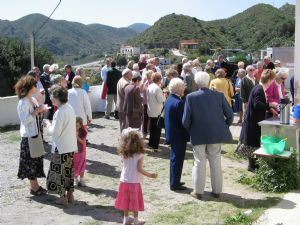 Turn right into the small village of El Agua de Enmedio and the church is two hundred metres up on the hill on the right. There is ample unrestricted street parking and room for a few cars on the church site for people who may find the steps a little too difficult. Turn right onto the unmade road after the high wall, then sharp right again up the hill. Look out for the pink sign' pointing to the church'. When travelling from the south (Carboneras), we are about 2kms on the left past the village of Sopalmo.